the Angry Turtle: "mid September update" or "I don't know what to call this post"
"mid September update" or "I don't know what to call this post"
A quick update, because I am trying to cut down my internet time and get to some serious sewing. Here's my latest lovely that I picked up from a garage sale for $75! My sewing machine I named after a lady in the bible who sewed clothes for people in need (Dorcus) and my serger needed a name. My mom sent me this scripture verse and suggested Sheba for a name. I like it. So, I'm happy to introduce you to Sheba! Sold with Sheba were these 2 feet and these bags of thread! I'd say that I got a great deal! In other news here's a picture of one of my kitchen chairs (we only have 2) that David recovered for me. I love them - I don't have before pictures because they were too embarrassing. He did a great job! And finally, I got to go see this movie with my friend last night and it was so wonderful! I will definitely own this one and torture my husband for years with it! It was such a cute and heartwarming chick flick that I definitely recommend it. Oh, and the soundtrack is divine... have to get it! This movie almost makes me want to learn how to cook.... almost! Very nice to meet you Sheba! You are quite a steal! 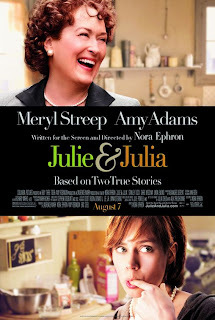 And Coralee - I'm jealous - I have not seen Julie and Julia yet (don't know when I'll be able to ) I know only a few local fellow bloggers - but i thought it would be a neat flic for fellow bloggers to see together! That's a great idea, Patty~Jean! I loved the blog component of this story and could totally relate to Julie's excitement over comments! I LOVE THIS MOVIE!! It was so good. Even Allister loved it! I saw this movie with a few girlfriends, but I think my husband would have liked it too. I loved it and we laughed all the way through it. Meryl Streep was great. I love that you name your sewing machine. Why didn't I think of that? Sheba was an awesome deal and I know you'll get a lot of use out of her. Enjoy her!